I thought this would be more appropriate for game updates than the "Favorite Board Games" thread. One of the goals I made for 2012 was to actually try to play games, rather than gripe about missing opportunities (our of laziness or shyness). So far so good — I've managed to play as many games in the past few weeks as I normally would over half a year. Lord of the Rings: The Living Card Game — I cannot stop playing this. It's one to two players, has beautiful art, and has enough challenging elements to be quite repayable. The game's system really fits thematically, too. It's also a living card game, too, which is cool...it's similar to a collectible card game (like Magic: the Gathering), but the expansions aren't randomized. Plus, you can just play the game with the core set and never buy anything else...unless you want to. Dungeons & Dragons 4th Edition — The most recent edition of the grand-daddy of RPGs has some aspects I don't like (some of the newer rule changes make the game more like a video game than a tabletop RPG), but I've played a few times with a co-worker and still had a blast. Android — Still my favorite board game. Still incredibly misunderstood. It's always a struggle to get any of my friends to actually play with me, but when I do, I savor the experience for months afterward. The game is an incredibly hard sell, even for avid board game players ("Hey, want to play a sci-fi noir game that is heavily focused on postmodern storytelling aspects? No? "), but I will continue to be an evangelist for it. Android is indeed a great game, but the hard sell is that it is such a looong game. Carcassonne and Settlers, of course. Wasabi!, a surprisingly fun tile game for the sushi fan. Talisman, the classic game republished, revamped and piled with expansions. Started playing this as a teen in the '80s, so part of its appeal for me is pure nostalgia. The original Dune game from Avalon Hill (see "nostalgia" above), still one of the best-designed games, with fascinating group dynamics (especially for fans of the book). Forbidden Island, a very fun (and surprisingly inexpensive) collaborative game. I've been told that King of Tokyo is a great little game to play. I want to try it out, it looks cool. YES! Someone else! SOMEONE ELSEEEEEE! How does this play with just two players? I've only tried it with 3+, but my wife loves it and thought it might be worth trying it with just the two of us. It's really popular, too! The first run sold out pretty quickly, but they're printing another run, from what I've heard. I guess Richard Garfield's name attached to the product really helps moves copies. Heard nothing but good things, though; let us know what you think if you try it. I haven't played Rex; mostly because I associate the game dynamics of Dune so much with the world of Dune, and I'm not familiar with the Twilight Imperium stuff. And honestly, at $60 for Rex I'd rather spend $100 for a used version of Dune. Citadels with two players is great! There are some alternative rules you have to use, mostly in terms of the initial selection of cards. I forgot, another favorite (though I don't yet own a copy): Betrayal at House on the Hill. Diplomacy: My favorite board game of all time. It's Risk without the chance element of the dice. It demands more personal interaction, conversation, intimate/secret discussion, plotting and strategy with each of your friends in the room than almost any other board game. Minus rolling dice; plus people skills, powers of persuasion and getting to know the people around you. Get the first edition if you can find it. The second, newer edition DOES fix some big problems, but also creates some new ones — low-quality pieces, poorly implemented haunt errata, and so on. ....demands more personal interaction, conversation, intimate/secret discussion, plotting and strategy with each of your friends in the room than almost any other board game. Diplomacy IS a classic, but trust me — there are quite a few hobby board games that also do the above well too. I'll whip up some examples. I don't think any are maybe as PURE (without game mechanics) as Diplomacy, though, which might be what draws you to the game. Fun (to me) story: there was a large-scale Diplomacy game played a year or two ago by a number of well-known board game designers, podcasters, and game publishers. They were playing it online over the course of several months (I think), and I think it go so vicious that they called the game before they even finished. That's good to hear; my brother has the first edition and he thought the second edition had better art and general look and feel. Too bad it's a mixed bag! Saw photos yesterday on the official Settlers of Catan facebook page of the Mayfair Games staff assembling boxes of Star Trek Catan! Oh, goodie, goodie, goodie! The English version releases in September as a Target exclusive. Heard a bit about this from folks that went to Gen Con — basically, it's vanilla Catan with the Star Trek theme pasted on. HOWEVER, there are a few new thematic things, including character-based cards you can get that can modify the game a bit. Android: Netrunner, the reprint of the legendary CCG from the '90s, is out. It is so good. Maybe one of the most balanced card games I've played. Haven't played Android but recently played Infiltration, which is a spin-off and it was pretty enjoyable. Played Lord of the Rings (or maybe it was the hobbit version) once and it was alright but not my cup of tea. Snake Oil (4 - 9 players)(more of a party game than a "board" game) - Similar to Apples to Apples, in that you choose word-cards from your hand and are trying to get your selection chosen by the player who is "it" this round, but instead of just needing to have the card(s) fit the indicated theme, you are trying to sell a new product to the "it" person who is given a role. They might be a dictator or a priest or Santa Claus and you make your selection based on what that character might buy. So if the "It" is a Cave Man, from my hand of Finger, Hell, Gas, Future, Shield, Urge, Soap, I might choose to sell him a product called "Soap Urge," which I might define as some pharmaceutical that promotes impulses toward cleanliness, "Because soap is useless, if you don't want to use it." The Cave Man (or whatever) would hear the pitches from all the players and then choose from among them whom to award the point. There is definitely a performative element, so it's not a game that will work with all crowds but with the right people it can be hilarious. Love Letter (2 - 4 players) - Super simple to learn, quick to play, lots of fun. The thread title doesn't specify new board games, so I'll add that yesterday my family played Can't Stop. That's my kind of game: not much thought required. My 12-year-old son James recently received Gobblet as a birthday present, and it's been a big hit in our family: much more interesting and complex than checkers, but not as challenging or time-consuming as chess. Handsomely made, too. What a good game! I don't know, though, Christian — the game is all about decision-making. So you do need to think; the game just isn't overwhelming with its choices (ala chess). Right! I undersold the decision-making aspect. It's one-dimensional, but ever present: Do I stop or keep going? Also, how to combine the dice. So ... yeah, I undersold the decision-making involved. Yeah, that simple "Press Your Luck" mechanic is genius. Sid Sackson, the designer, was a legend. Infiltration, which yank_eh mentioned above, uses something similar (and while it's a fun game in its own way, it's no Can't Stop). 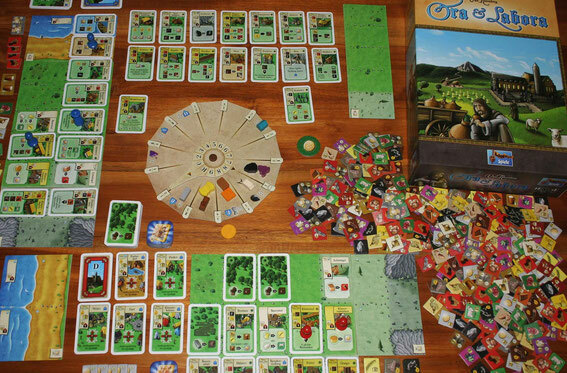 New favorite game: Ora et Labora. Each player is in control of a monastery in either medieval Ireland or France, and you try to make the most effective economy to win. It's not an overly complex game, but the amount of options and strategic options are bewildering. It has a brilliant "wheel" of sorts that controls how many resources are available each turn. Hey Jason (or anyone else), have you ever played Memoir '44? Oh yeah, Memoir is your best bet here. It's easy enough that you should get into it after a few plays. Plus, if you like it and play it all of the time, there are tons of expansions for the game. It's also nowhere near as complex as something like Advanced Squad Leader or any other of those simulationist war games. Thoroughly enjoying Memoir 44 this week with my kids. The box says ages 8 and up, but I found the learning curve a little steep for the younger set. My 14-year old dove right in with ease after about ten minutes. Average game is about 30-40 minutes max, which is also a huge plus. Days of Wonder also offers a a really nice-looking online version of the game. This was a big help for the kids (and me! ), because we could test drive the game without set-up and actually get to see gameplay details in real time against either the computer or a random online opponent. Wow, this is a board game? Has anyone here played Eclipse? It's apparently an interstellar battle scenario, with four basic steps: Acquire ships, Acquire armament, Attack, and Upkeep, I'm going on vacation next week, and half of that time is going to be spent up in a cabin with some gamer friends of mine. We're kind of into a lot of games, anything from light card games such as Guillotine, to board games like Risk (various versions), to some more involved RPG's but usually the kind you can play in a couple of hours. Anyways, someone posted a game in progress photo of Eclipse over the weekend, and I did some investigating into price (fairly expensive - $70 price range), longevity of the game, and (most importantly) learning curve for the initial first time run. I've read some great reviews, but most say that the first run can be fairly long (one review said it took nearly two hours to set up the board and go over instructions, plus another 4hours for the game to play out). I'd like to hear some first hand experience. Or, am I better off picking up a copy of The Good, the Bad, and the Munchkin, combine that with Star Munchkin, and see how close we can come to playing a version of Firefly Munchkin? I own Eclipse, and I love Eclipse. Let's talk about Eclipse. I've played some long space-themed games that have taken a while (Twilight Imperium, long considered the iconic "4X game," takes around 14 hours). Compared to that, Eclipse isn't bad at all. The game is surprisingly easy to learn, I think, because Eclipse meshes some European-style game mechanics with the epic space stuff. It also has—hands down—the best iconography I've seen in a board game. Chances are you can figure out a detail you aren't sure about by paying attention to the symbols used on the game board and on the player mats. The game flows really well, and there are definitely different ways to win (hence the 4X moniker: expand, exterminate, explore, exploit...you can focus on any of these and still have a fighting chance of winning). 1) Read the rules ahead of time. I cannot stress this enough. EVERYONE going needs to do this. This will save you hours of time, and even if everyone is still shaky on the rules, you'll be able to easy work through the first few turns of the game much easier than you would if one person is just scratching their head. 2) While the game retails for $100, it's starting to drop down closer to $50 all of the time (Barnes and Noble put all of their copies on clearance about two months ago, where I picked my copy up for $50). If you keep an eye on the Board Game Geek "hot deals" forum, you're bound to see a sale soon. It's one of the best board games I've played, so I hope you get a chance to play it (especially over, gulp, something like Munchkin ).